Strains and Sprains - body, causes, What Are Strains and Sprains? Strains and sprains are injuries to the body's soft tissues. Strains are injuries to muscles and/or tendons, which are the cords that connect muscles and bones. Sprains are injuries to ligaments, which are bands of connective tissue that support the joints and connect the bones to each other. Strains and sprains may result from sudden injury or from long-term overuse. Strains and sprains are injuries to the body's soft tissues—its muscles, tendons, and ligaments. They are everyday occurrences for athletes but can happen to anyone as the result of a fall, a twist, or any other sudden blow to the body. Strains are injuries to muscles or to tendons, which support the bones and connect them to the muscles. Sprains are injuries to liga-ments, which are bands of connective tissue that support the joints and connect the bones to each other. Strains and sprains are injuries to the muscles, tendons, and ligaments. Strains occur most often in the muscles and tendons of the legs and back—hamstring pulls, groin pulls, and sore back muscles are common forms of strain. Sprains most often affect the joints, such as the ankles, knees, and wrists. Both strains and sprains cause pain, swelling, and inflammation * . The injured area also may be discolored if it has been bruised and blood pools underneath the skin. Most people recover from strains and sprains if they see their doctor promptly and follow the doctor's instructions, which often involve a R.I.C.E. protocol: rest, ice, compression, and elevation. Doctors usually classify strains and sprains by the degree of damage done to the muscles or ligaments. A first-degree strain or sprain causes the least amount of damage or stretching of ligaments or muscle fibers. There are no tears in the tissue fibers, pain and swelling are minimal, and range of motion (movement up and down or sideways) usually is not affected to any important degree. There may be some slight disability in using the affected joint, but on the whole, people can resume normal activities after a short recovery period. In a second-degree strain or sprain, about 80 percent of the tissue fibers are ruptured. There is more pain, there is edema * , and range of motion is reduced. Unlike first-degree injuries, it may be 2 to 3 weeks before the pain and swelling begin to show real improvement. For athletes who resume their sports activity too soon, there is the possibility that a second-degree injury will turn into a third-degree injury. A third-degree injury takes about 8 to 10 weeks before it begins to show signs of improvement. Bracing with compression bandages or splints can help most sprains heal quickly. © M. andD. Long/Visuals Unlimited. In third-degree injury, there is a 100 percent rupture in all the tissues that surround the joint capsule muscles, tendons, and ligaments. A person with a third-degree sprain or strain can no longer use the injured part of the body, and there will be pain and visible bruising. X-rays may show that even though gones have not been broken, there may be chips pulled from the bone called avulsion (a-VUL-shun) fractures. 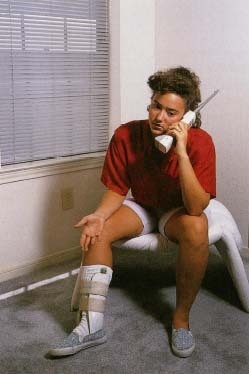 The injury usually will have to be protected for 8 to 10 weeks, and surgery may be necessary to repair damaged joints. * edema (e-DEE-ma) means swelling in the body's tissues caused by excess fluids. What Is the Treatment for Strains and Sprains? R: Rest. How much rest depends on the degree of injury. I: Ice. Ice is used to reduce inflammation. C: Compression. Bandages and wraps are used to reduce pain and swelling, and to help ruptured small blood vessels heal more quickly. E: Elevation. Lifting the injured area above the heart helps keep swelling down and blood from pooling in the area of damage. D: Drugs. Doctors may recommend use of aspirin, ibupro-fen, or other anti-inflammatory medications during the first few days after the injury. I: Incision, drainage, and injection. These procedures sometimes are necessary for third-degree sprains. E: Exercise. It is important to learn the proper way to exercise after these injuries. T: Therapy. Sometimes physical therapy may be necessary to get the injured part of the body back in use without injuring it again. S: Surgery. As with bone fractures, a bad strain or sprain may need surgery to repair damaged tissue. Can Strains or Sprains Be Prevented? Clearing ice away from porches, steps, and sidewalks. Wearing shoes and boots with nonskid soles. Using hand rails on stairways. Using rubber mats in tubs and shower stalls. Using rugs with nonskid backing. Making sure there is adequate lighting for night-time entrances. Keeping a night light or wall light between bedroom and bathroom. Making sure always to keep tools, toys, and other items away from places where people can trip over them. Making sure ladders are steady. Rules for athletes include starting slowly, stretching frequently, and always remembering to warm up and cool down before and after strenuous exercise. Athletes and those who exercise for physical fitness are at risk for strains and sprains. The branch of medicine that specializes in treating these injuries is called "sports medicine." Doctors who specialize in sports medicine can help athletes improve performance without injuring the body. They also can test athletes for drug use, treat injuries that result from exercise or sports, advise about proper clothing and protective gear, and supervise diet and fluid intake during training and travel to foreign places. U.S. National Institute of Arthritis and Musculoskeletal and Skin Diseases (NIAMS), Building 31, Room 4C05, Bethesda, MD 20892-2350. NIAMS posts information about shoulder problems at its website. American Academy of Orthopaedic Surgeons (AAOS), 6300 North River Road, Rosemont, IL 60018-4262. AAOS posts Sprains and Strains and Shoulder Pain patient education fact sheets at its website. Arthritis Foundation, 1330 West Peachtree Street, Atlanta, GA 30309. The Arthritis Foundation publishes brochures and posts fact sheets about many different kinds of soft tissue injuries at its website. American Physical Therapy Association (APTA), 1111 North Fairfax Street, Alexandria, VA 22314-1488.